Where can I see an armadillo? If you’re trying to find an armadillo, start by looking at the right time of day. Armadillos in general are nocturnal animals, and they tend to be most active around dawn and dusk. You can also increase your chances of spotting one by looking in the right place. 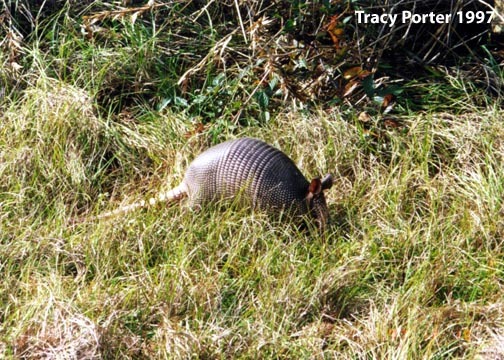 Armadillos like areas with brushy undergrowth to hide in, easy access to water, and open areas to forage in. You can also ask the local residents if you get stuck; It’s quite likely that someone will know where to look, even if it happens to be their own yard. The nine-banded armadillo is the only species found in the United States. These armadillos can be found in the southeastern United States, including Texas (map), Louisiana, Arkansas, Alabama, and Florida. Recent reports suggest that the armadillo has moved northward as far as southern Indiana in the midwest. Based on email I’ve received, there are scattered reports of armadillos near New York City on the east coast, and as far north as Oregon on the west coast. 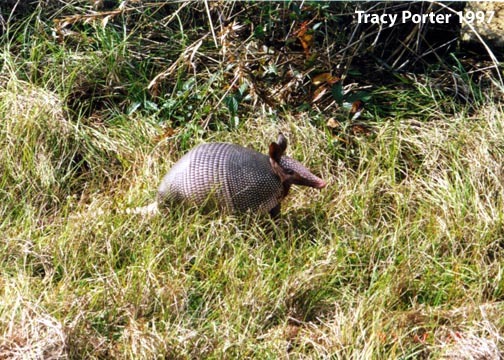 However, these are unconfirmed reports; even if they are actual armadillo sightings, they are extremely unlikely to represent established year-round populations of armadillos. The best estimates for the current and future projected distribution of the nine-banded armadillo in the US can be found on the Armadillo Expansion page. Nine-banded armadillos, as well as the other 19 armadillo species, can be found throughout South and Central America. Actual distributions of each species is variable; the nine-banded armadillo, for example, can be found from the United States to Peru, while others are only found in very limited regions of one or more South American countries. For the specific geographic range of each type of armadillo, please see the Armadillo Species page and choose the one you are interested in.